The glazed ceiling panel construction robot presented in this chapter combines an aerial work platform and a multi-DOF manipulator. 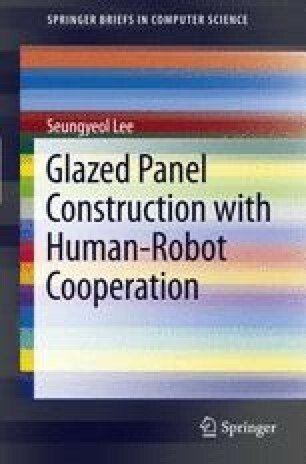 One of the advantages of the proposed robot is the glazed ceiling panel installing by human–robot cooperative manipulation. A HRI device and the vacuum suction device combined with the multi-DOF manipulator are included in this work. Designing of a robotized construction process and field test using the robot is applied on a construction site.